Learn the Bible - and SEND Gods Word! Help Send God's Word to People in CHINA! Bibles For The World touches the lives of individuals and families with the Gospel of Jesus Christ in many nations across the globe by making Bibles available where God's Word is scarce. 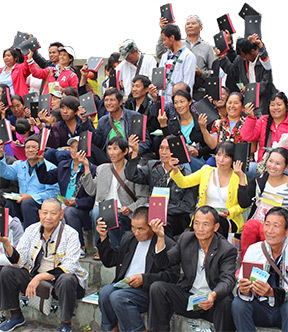 Your special tax-deductible gift will help provide God's Word to people in CHINA, where Bibles For The World has reached more than one-half MILLION people with copies of God's Word! There is a deep hunger in China to learn about God and His love and forgiveness through Jesus Christ. Your support of Bibles For The World will help men, women and children there who are eager to discover the truth of the Gospel! If you can give $30 or more, we'll send you a flash drive with all 365 Audio Programs of Learn the Bible in a Year! 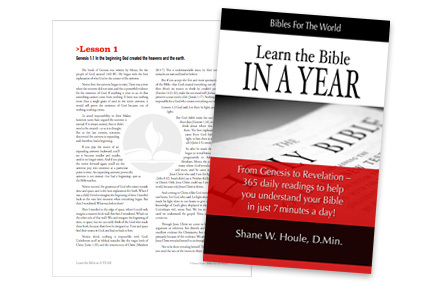 Your "lesson a day" will help you walk from Genesis to Revelation. If you can give $50 or more, we'll send the flash drive of Audio Programs AND a copy of LEARN THE BIBLE IN A YEAR! -- the wonderful book by noted Bible teacher Shane Houle. This 585-page volume will walk you from Genesis through Revelation in 365 daily lessons.